Next Action sales methodology, developed exclusively for OnePageCRM, was inspired by a GTD technique (Getting Things Done by David Allen). Same way as GTD increases productivity and improves time management when the Next Action is applied to sales it's a powerful tool to make you focus exclusively on sales. By encouraging upfront decision making and applying the Next Action to each of your leads and customers, you are ensuring that you will never miss any opportunity to sell. 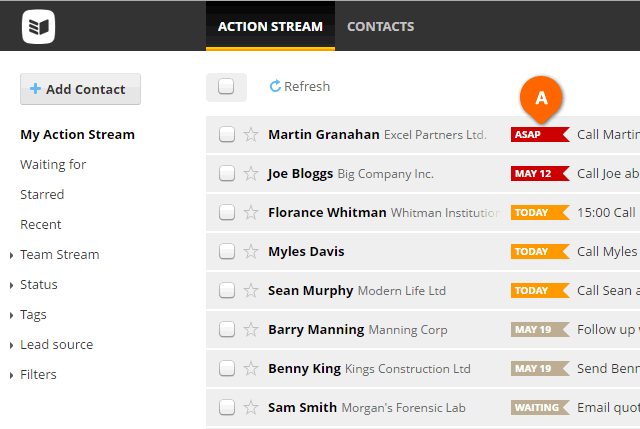 All your Next Actions are displayed in the dynamic list called your Action Stream that floats the task to the top when the action needs to be done. This means keeping your head clutter-free and the great feeling that you're staying on top of your contacts and sales. These Next Actions are sorted in order by their due date, making sure that you focus on completing the most urgent tasks first (see A).